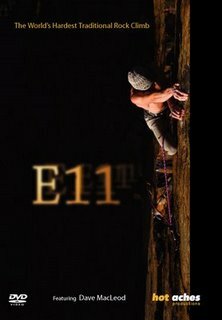 The 2006 Edinburgh Mountain Film Festival was packed and buzzing with anticipation, if not a little apprehension, after the bowel-loosening trailer for E11 came out some weeks ago. That pounding music, the slow-mo falls as they began... the sudden quickening wipe to the leg wrapping round the rope, the accelerating swing-in after 60 feet...crunch! I was wringing my hands as if I had turned up to watch a live car-crash. But my climbing lasciviousness was gradually eroded as Hotaches Productions pulled off a major feat in climbing film-making: a 'real film' about a climber's savagely withdrawn successes and crushing lows as Dave MacLeod attempted (over two years) to climb the awe-inspiring line of 'Rhapsody' at Dumbarton Rock. Paul Diffley has directed the film with feeling and pulled out some true performances from both Claire MacLeod and Dave MacLeod as the film delves into the personal traumas of obsession and the dangerous emotional tightrope of a climber maybe going too far... as Dave gets closer (or is that further?) from completing the route, their relationship becomes frazzled and we really want to know what climbing is truly worth... how far should we take it in pursuit of a dream? At what point do you say 'enough'? This is the real subject of the film - not the big numbers, nor the rock-speak, nor the rollercoaster moments as Dave takes each fall... the most emotional moment is a tenderly caught reconciliation as Dave calls Claire on the mobile for a 'lucky' belay... something Claire admits she should have done six weeks ago! The incidental interviews with Niall McNair, Cubby Cuthbertson and others cleverly punctuate the film with historical context and some tension-relieving humour. The subject of the film is an E11 after all, and no-one can sustain 40 minutes of nerve-shredding footage of someone falling so horrifically. The film footage and photography from Dave Brown and Steve Gordon is breath-taking, with the sequence of falls proving the centre-piece of the actual climbing footage. Still shots are interjected with live footage to create a paranoid apprehension of impending doom. The section where Dave consistently falls from the final hold is gut-wrenching every time... we know what is at stake by now and the heart-pumping score builds every time to the moment the hand slips... what follows each time is the stuff of nightmares. Nightmares someone actually filmed. As pure climbing spectacle, this says it all about commitment. You know there is a deeper reason to Dave's climbing other than big numbers if he is prepared to take these falls. The film asks this question directly and persistently, which is why it wins me over. Claire proves a fantastic and sharp foil to Dave's often vague and increasingly unsure justifications for this route... as his motivation wavers and finds less and less reason for clinging to his obsession, Claire patiently explains the sacrifices and normalises Dave's extreme behaviour - these moments become at times the highlights of the film as we see Claire trying desperately to hold on to some sense of normality when her husband has plainly gone insane in a climbing kind of way! There are no pretensions to this film: it in no way sets out to glorify extreme climbing or 'pimp' Dave's ride. The background is industrial and subdued, the music is sourced independently (check the credits and buy their tunes!) the extras are local (and amusing) - there is a sense of great things being achieved quietly in a vacuum of general ignorance and it becomes very much an internalised journey as we see Dave 'disappearing' emotionally and perspectively from the outside world. I think we should be proud we have film-makers like this, prepared to put in so much of their own sacrifice to bring human struggle to light... the final redemption of climbing 'Rhapsody' was superbly conveyed, and hundreds of people appreciated the heartache involved with a spontaneous round of applause as Dave topped out on his E11 and shook with relief and disbelief at once.